Final Approval was granted by the Committee for Envirocleanse inTank™ BWTS(Electrochlorination Variation) submitted by Norway (MEPC 73/4/1). The solution generates sodium hypochlorite [NaOCL] by electrochemical activation in a fully closed system which is dosed as an Active Substance into the ballast water whilst vessel is in transit. A small portion of ballast water is circulated from one tank at a time, passed through a dosing module and returned to the same tank via patented mixing nozzles. The circulation loop provides the means of applying and mixing-in the active substance. Consistent and successful inactivation of target organism and pathogens is verified and controlled via a commonly applied water treatment metric: Concentration-Time dosing [C/T-dosing]. CT-values are measured as Total Residual Oxidant (mg/ltr) x Contact time (in Hrs). Monitoring of residual oxidant levels of ballast water occurs during carriage in tanks and application of a “maintenance-dose” prevents organism regrowth. Prior to discharge, appropriate amounts of sodium thiosulfate are introduced to neutralize any remaining oxidant. The full treatment cycle is completed during ships voyage. 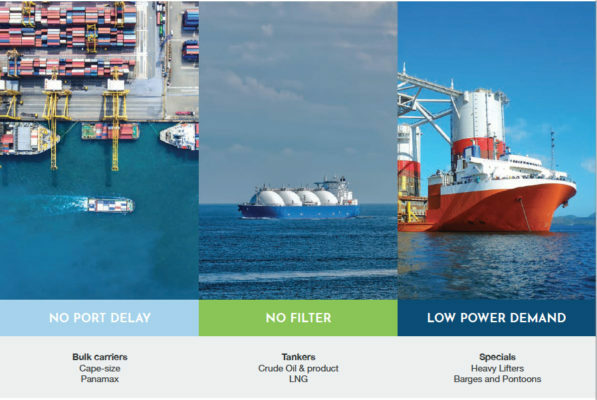 In contrast to inline ballast water treatment systems, the inTank™ solution does not intervene any ballast flow whilst in port, at terminal and has No filtering-mechanism. Treatment based on recirculation during ships voyage elegantly avoids operational and commercial risk for time critical high ballast dependent ships whilst introducing the ability to control regrowth during longer voyages. The best confidence of regulatory compliance with the least impact to vessel operations.